How was your winter holiday? Did you get a good rest? Hopefully all charged up, ready for the new year? ;-) And how did your first week of 2013 pan out? Back to school or work already? 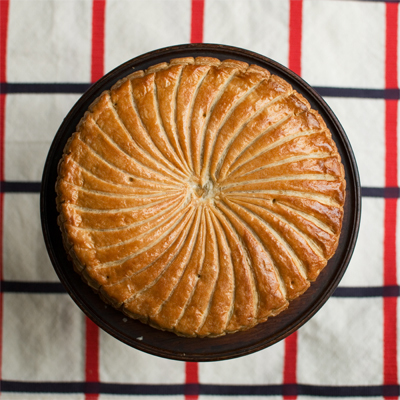 For me, soon as entering the year, all I think about is the Galette des Rois for Epithany (which was the 6th January). I mean, how can I work on a pastry that requires so much attention when interruptions aplenty! The kitchen is a highway of coming ins & outs, “S” to show me a drawing or “I” to ask me to solve a quiz. Sometimes it could be a “come upstairs & look at my lego model”, or it might be the little one forever pulling the hem of my skirt as I move around in the kitchen. Running around the central kitchen-island playing chase might be an option for them too… It’s simply impossible to do anything that remotely needs concentration…! So, at times like that, I put my hand up & resign, I let go of any baking desires & join in with running around playing chase too. Might as well, hey. Anyway, so here’s my Galette des Rois, that was not made on Epithany day, but on the following day. This year I made three. Shame about the unsightly middle, but atleast it came out circle & relatively flat! To etch the swirls, I used the edge of a round cake card to depress an impression, & then use that as the guideline to score with a scalpel knife. When scoring, I always apply same pressure & “try” to cut less then 1mm deep. (… notice “try”. It’s su~per difficult!!!) Lastly I brushed cooled down sugar syrup on just-baked hot galette to make the surface shiny & appetizing. The momentary sizzling sound as the syrup initially hits the hot pastry is one of my favourite sounds in the kitchen. Grr, there’s a crack in the design…! Humph. But I think the colour is the best out of the three. I dissolved coffee granules in the egg wash to make it dark – this technique is the same as when egg-washing the Gateau Basque. Also, have you noticed that the edges are scalloped? Well, instead of cutting around the pastry with a knife like usual, I used the tart tin edges like a cutter!!! 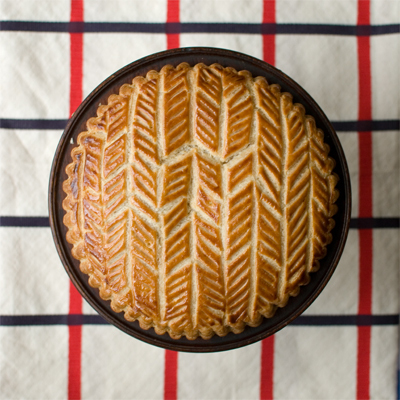 There’s a couple of advantage point to my technique other than aesthetics – as you press the tin down to cut off the excess pastry, it seals the two sheets of pastry tighter together. You can also use the scallop shape as a guide for when crimping the sides. Anyway, hope all is well with you guys! Chao for now! Happy New Year to you too! Beautiful galettes! Your face design one, it truly is an original as I have never seen it anywhere like it, well done! I look forward to more of your posts this year! Happy New Year to you and your family too! May 2013 be a year filled with joy and laughter for all of you! And thank you! 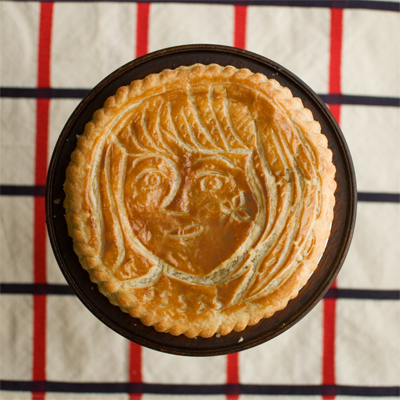 The face design, yes, I haven’t seen it done on a Galette des Rois either! I think it’s my fave out of the three above! I suppose, if one is really good at etching & have illustration skills, there can be lots more interesting pictures, like a forest scenery or something?? Ps: nope, I haven’t eaten all! There’s some left…@@ But I’m not complaining, I’ll eat them over the course of the week! Lol! How lovely all three are! I know you are a perfectionist, but I think the slight irregularities make a more beautiful cake since it does not have the appearance of a product stamped out by a bakery. As has already been said, the face design is so original and most charming. And thanks for the inspiration, especially the tip about using a tart pan as a cutter. What a good idea! And ah! Actually I agree with you on the ‘irregularity’ front also! It’s just that, after the initial making (4hours+) & the lo~ng wait to use the puff pastry while it rests in the fridge for 12 hours, you’d want it to be perfect y’know, it becomes such a big deal! LOL! Hi Anne!! Good to hear back from you!! How fantastic that yours also came out well!!!!! Poornima, happy new year to you too~!!!!! Happy New Year Tamami chan! I see you’ve already been busy in the kitchen this year with those beautiful galettes while the kids are at school! “I” and “S” are so lucky to find such delicious cakes waiting for them at home. We are all doing well over here and will try to write an email soon. I look forward to all your yummy posts again this year! Take care and give my love to all your family! I’m horribly late, but happy new year!!! Hope your year has gotten off to a great start and that you’re enjoying your break from the market. And Galette Des Rois! Good luck! Are you making from puff pastry? (Late) Happy New Year, and thank you for becoming an inspiration to me :) Am on the process of opening a cake market stall in Prague, and your blog made me have hopes and motivation. Wishing you all the best, and will be following you blog with much interest ! The galettes look wonderful. You are a skilled baker. I hope you enjoyed them fully with your little ones and family. It is great to have you back. Looking forward to a year full of wonderful posts from you. Wow, thank you very much for your kind words, it means a lot to me! – Good luck with your new stall!! I believe baking cakes bring many happiness to people including yourself! Greetings Tamami! So glad to see this post! You turned me into a Galette des Rois nut and I frequently make them to sell at the Farmers Market! I love the new design ideas and look forward to incorporating new ones into my own. I hope you are well and enjoying 2013.